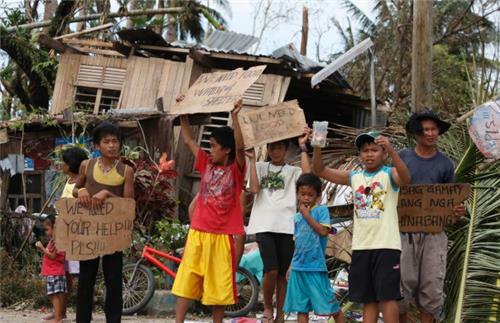 Dazed survivors beg for help and scavenged for food, water and medicine after a super typhoon kills an estimated 10,0000 in the central Philippines. 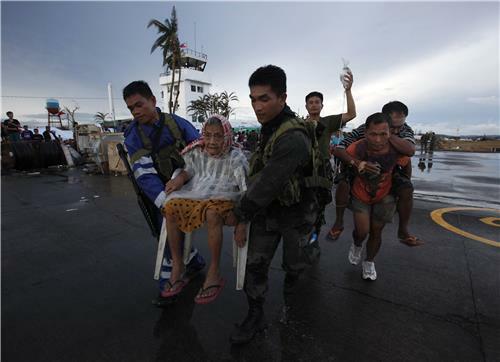 Rescue workers tried to reach towns and villages in the central Philippines on Tuesday that were cut off by a powerful typhoon, fearing the estimated death toll of 10,000 could jump sharply, as relief efforts intensified with the help of U.S. military. Officials in Tacloban, which bore the brunt of one of the strongest storms ever recorded when it slammed into the Philippines on Friday, have said the death toll could be 10,000 in their city alone. 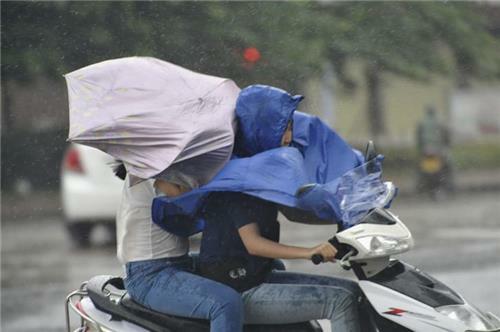 Compounding the misery for survivors, a depression is due to bring rain to the central and southern Philippines on Tuesday, the weather bureau said. "I think what worries us the most is that there are so many areas where we have no information from, and when we have this silence, it usually means the damage is even worse," said Joseph Curry of the U.S. Organization Catholic Relief Services. 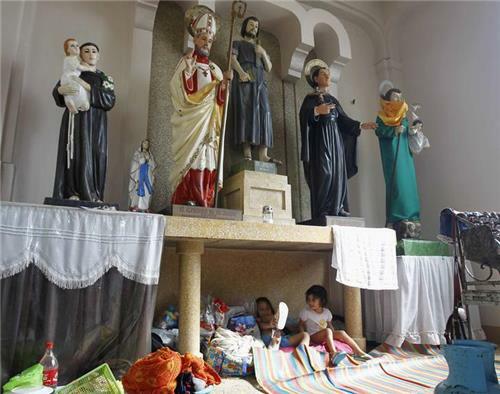 The "sheer size of the emergency" in the wake of the typhoon was testing relief efforts, he told NBC's "Today" program on Monday, speaking from Manila. A U.S. aircraft carrier set sail for the Philippines on Tuesday to accelerate relief efforts after a typhoon killed an estimated 10,000 people in one coastal city alone, with fears the toll could rise sharply as rescuers reach more isolated towns. The nuclear-powered USS George Washington, carrying about 5,000 sailors and more than 80 aircraft, was joined by four other U.S. Navy ships and should arrive in two to three days, the U.S. Department of Defense said on Monday. The International Red Cross and Red Crescent Movement is appealing for 87 million Swiss francs ($94.6 million) to assist the estimated 10 million people affected by the strongest typhoon ever to make landfall in recorded history. Within the overall appeal, the International Federation of Red Cross and Red Crescent Societies (IFRC) is asking for 72 million Swiss francs to provide 100,000 families with food, clean water, shelter and other essential relief over a period of 18 months. And the International Committee of the Red Cross (ICRC) is seeking 15 million Swiss francs specifically for areas already affected by armed conflict. - WFP will provide 1,000 metric tons of these biscuits in the early stages of the response because they are light, nutritious, easy to transport and do not require cooking. 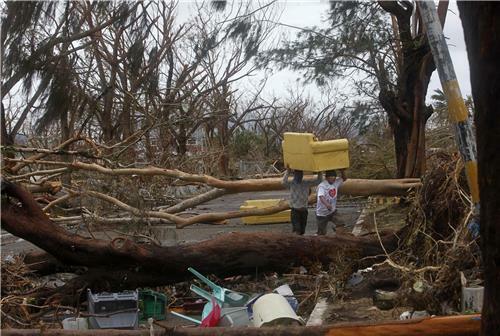 UNICEF is sending therapeutic food for children, health kits and water and hygiene kits, and redeploying staff already in the Philippines to the hardest hit areas. Another $1.3 million worth of emergency supplies is being airlifted to the Philippines from the UNICEF supply centre in Copenhagen, while additional UNICEF emergency aid workers and supplies from other countries will also be sent to respond to the disaster. “The first priorities are focused on life-saving interventions – getting essential medicines, nutrition, safe water and hygiene to children and families. Our utmost efforts will be to help ensure that the vulnerable and affected children are protected,” Tomoo Hozumi, the UNICEF representative in the Philippines, said in an appeal for donations. 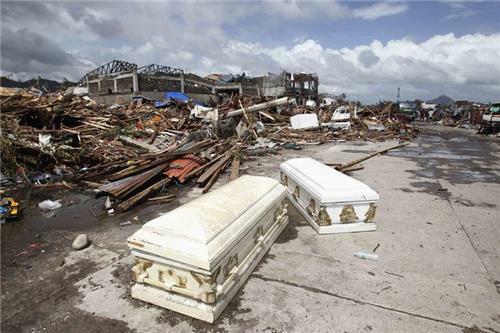 Officials in Tacloban, which bore the brunt of one of the strongest storms ever recorded when it slammed into the Philippines on Friday, have said the death toll could be 10,000 in their city alone. 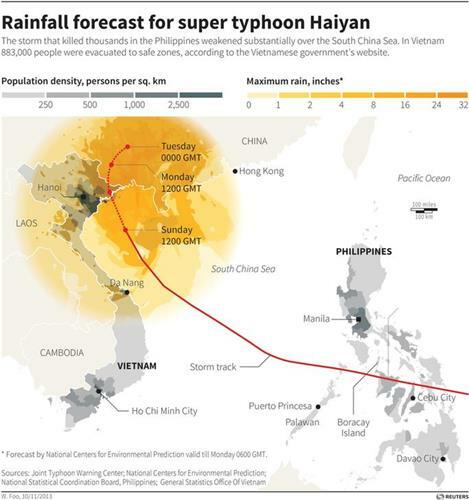 Reuters Graphic shows the path of Typhoon Haiyan. 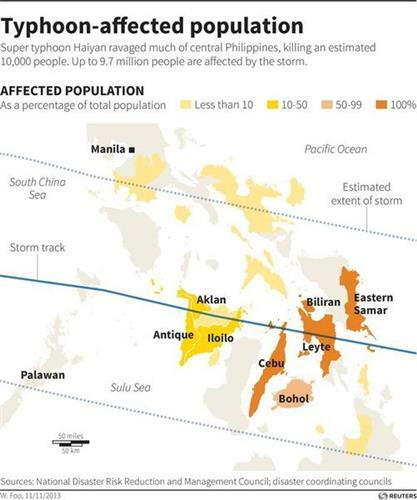 Map shows the storm's path, approximate rainfall and population density in the Philippines. 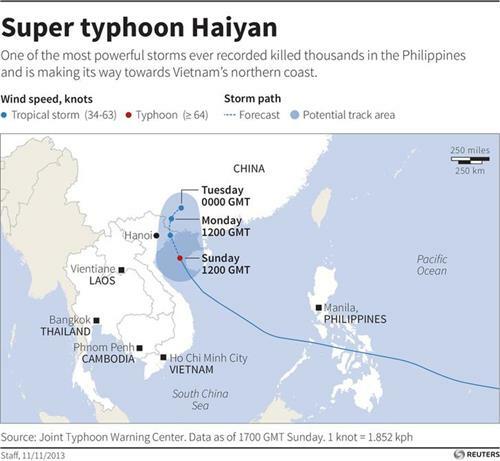 Map of the western Pacific showing potential track of Typhoon Haiyan as it heads towards Vietnam and China. Readers, there is an initial picture floating around Twitter but we are waiting to confirm it. It looks like a small boat, too small to fit 200 people. Note that initial reports are of at least 200 people, according to Italy's navy, but that doesn't mean the number won't change as we learn more. It's quite likely the number will change, and we will make sure to state when something is a report versus a fact. Please let us know if you have any questions using the "comment" option on the live blog bar above. UPDATE 1: the picture reference above was from 2011, and has been debunked. There is a second unconfirmed picture of two people being rescued from the sea, and we are working to confirm that now. UPDATE 2: the second picture referenced in Update 1 is confirmed as being from the October 3 boat that sank off the coast of Lampedusa. - White House troubled by Al Shabaab recruitment in U.S.
LONDON - A British security source said on Tuesday it was a possibility that the widow of a suicide bomber who attacked London in 2005 was involved in the siege of a Nairobi shopping mall where Islamist fighters killed at least 62 people. When asked about reports that Samantha Lewthwaite, dubbed the "white widow" by the British media, was directly involved in the attack in Kenya, the source said: "It is a possibility. But nothing definitive or conclusive yet." The security source spoke on condition of anonymity. Lewthwaite is the widow of Germaine Lindsay, one of the suicide bombers who killed more than 50 people on London's transport system in 2005. She is thought to have left Britain several years ago. 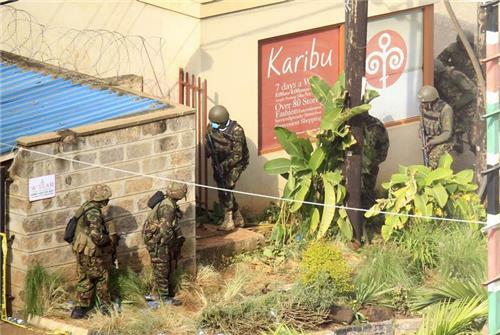 NAIROBI - Somalia's al Shabaab Islamist group says there are "countless dead bodies" in a Kenyan shopping mall as security forces searched for militants still holed up in the complex after a weekend attack that authorities say killed 62 people. Tweet by Kenya's Interior Secretary Interior: "I urge Kenyans to avoid racial slurs. If we do that, then the terrorists would have won. 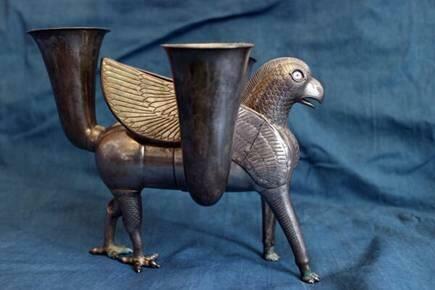 Be responsible in your engagements online." 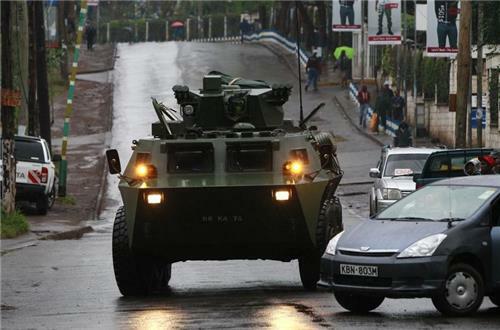 The Kenya shopping mall standoff escalates with multiple gunshots fired and smoke billowing into the air on the conflict's third day. Nathan Frandino reports. 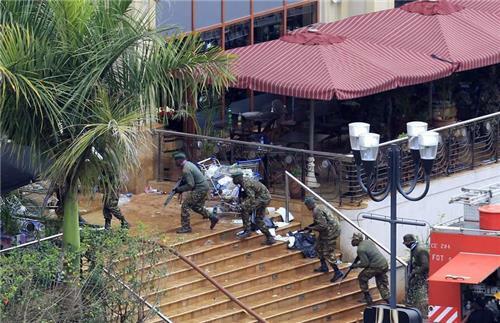 Tweets by the Kenya police: "The fire at Westgate mall has been contained by firefighters. We appeal to Kenyans to remain calm and report any suspicious looking individuals or activities to the nearest security agencies of the government. We hail the efforts of the brave and selfless men and women who are putting their lives on the line in the defense of our country. 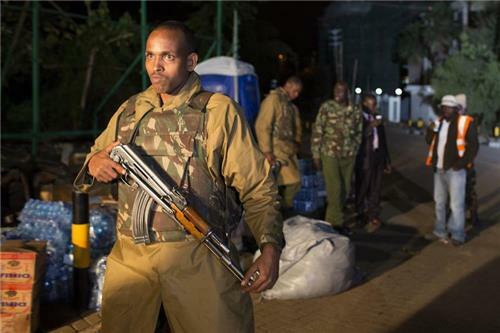 "We've arrested more than 10 individuals for questioning in relation to the Westgate attack." 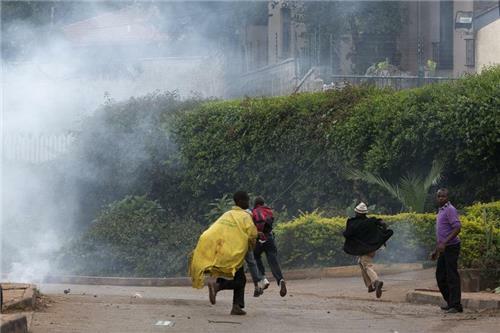 Tweet by Inspector General of the Kenya Police National Police Service: "Taken control of all the floors. We're not here to feed the attackers with pastries but to finish and punish them."